Social Security Numbers for Indians? Good Luck with that! India has a population of 1.2 billion people. Thats a lot! But that did not stop the Indian Government from letting Accenture, a US based IT firm, win a contract by the Unique Identification Authority of India (UIDAI) to provide a unique identification number to all of its people. The program called Aadhaar ID program requires Accenture to provide multi modal biometric identification technology. The whole idea is to give every Indian resident a unique number, similar to the Social Security Number that is given to every American in the US. The Aadhaar scheme claims that this will make it easier for the government to function and also make it easier and secure for people to access government and commercial services. Accenture will work under many get this mammoth project done. Accenture will start to issue up to 200 million enrollments. Following which the company would work for a period of two years to get as many Indians enrolled into the program. The new system will help manage identity-related de-duplication and verification requests from both public and private organisations. To increase security the new system will also implement a biometric system to record the personal information of citizens. It will be interesting to see how Accenture will go ahead with the system. India has 1.2 billion people and Accenture claims that it will work to get the unique identification numbers to every Indian and to the remotest residents in India. 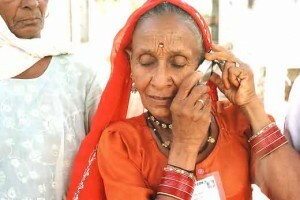 We had reported earlier that India has about 584 million cell phone subscribers and growing every month. Thats half the population which is almost twice as much as the US. Accenture could easily track someone with their cell phone number. If at all the project were successful India would join the ranks of those nations that suffer with the plague of identity theft. Lets see if Accenture alone can get the project done. Ear Scanners to be used for Airport Security? !